Foundations of Library and Information Science 3 Edition To meet the evolving needs of a dynamic profession, the new edition of Richard Rubin's best-selling text has been streamlined using feedback from faculty, students, and an outstanding Editorial Board: Kendra Albright, SLIS, University of South Carolina; Joseph Janes, Th e Information School, University of Washington; Michelle Cloonan, GSLIS, Simmons College; and Michael Stephens, GSLIS, Dominican University. Rubin observes in his preface, "Our profession demands constant growth, continuous learning, and very open minds." Accordingly, this meticulous revision of his landmark text includes a completely fresh discussion of the most current issues and key technological developments in the field. Rubin explores the ever-growing impact of the World Wide Web, the impact of blogs, wikis, and social networks on services, electronic publication including e-books, digital libraries, digital preservation, mass digitization, and digital repositories, and Functional Requirements for Bibliographic Records (FRBR). 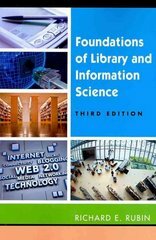 His unique insights into these technologies and their impact on library services, policies, and legal standards--are all part of why this book forms the essential foundation one needs to succeed as an information professional. Rubin integrates contemporary coverage with a detailed and accessible account of the fundamental principles of information science and technology, information policy, intellectual organization, and ethical issues and principles across all types of libraries: public, academic, school, and special.